There is no need to choose between high performance or increased efficiency to achieve better value and lower operating costs. The New R and F Series of cooling fans and impellers from NMB introduces a new generation of high performance products that offer total cooling solutions without compromise. The R and F Series are the most efficient cooling fans in the market today. NMB Technologies Corporation, a Minebea Group Company, has released a new generation of high power, high efficiency series of cooling fans and impellers for demanding applications such as storage and server rack systems, routers and switches, base stations, modular data systems, as well as medical and industrial applications. The new R and F Series of high power cooling fans achieve new benchmarks for airflow performance and are the most efficient fans in the market today. Some of the design highlights of these new series include a new high efficiency 3 phase motor designed with NMB developed magnet materials. Using advanced modeling techniques for the airfoil design has resulted in this new series of cooling fans and impellers that are best in class in aerodynamic performance. The R Series offers two sizes, the R150 as a 150mm X 172mm X51mm and the R172, a 172mm X 51mm DC cooling fan. These R Series fans introduce upgraded features such as open or closed loop speed control, digital bi-directional control, direct thermistor control, quick customization with simple code changes and auto brake. 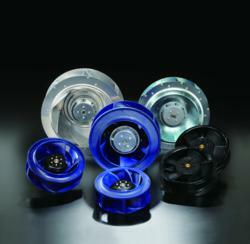 The F Series is a high power series of impellers. These range in sizes from the F175 model at 175mm X 69mm, the F225 at 225mm X 99mm, the F250 at 250mm X 99mm and the F280 at 280mm X 129mm. These series of DC cooling fans and impellers are all high efficiency, superior aerodynamic performance, control flexibility, easily customized, and are available right now from all our authorized distributors. About NMB Technologies Corporation – NMB Technologies Corporation, a Minebea Group Company, is the world's largest manufacturer of miniature precision ball bearings and a volume leader in the design and manufacturing of precision electro-mechanical components, including cooling fans and blowers, precision small motors and mechanical bearing assemblies, and it has now introduced a new series of programmable LED drivers. NMB products can be found in the personal computing, networking, telecommunications, home entertainment, home electronics, and automotive, medical and industrial markets. For more information on NMB Technologies Corporation visit: http://www.nmbtc.com or contact us directly.